Sewajibnya semua menteri belajar bersikap macam Tun M kalau nak jadi pemimpin yang ada karisma dan berwibawa. 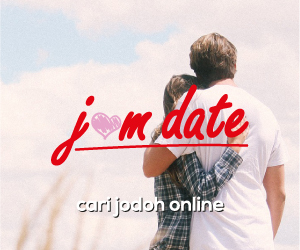 Deal Tun M mudah saja. Hang tak mau beli minyak sawit kami, kami akan beli jet dari China. (Padahal Tun tahu, jet Eropah terutama Rusia lagi berkualiti dan China pun pandang minyak sawit kita sebelah mata). Nah, Rusia dengan selamba tawarkan untuk beli semua minyak sawit kita. Win-Win..! LANGKAWI: Russia is committed to drastically increasing its purchase of palm oil from Malaysia, said its top defence procurement official. The palm oil purchase will entail an offset deal leading to the Royal Malaysian Air Force (RMAF) disposing of its two squadrons of 18 decommissioned MiG-29N Fulcrum jets. Russia is already assisting in refurbishing the ageing fleet of 18 Sukhoi Su-30MKM Flankers, via its local partner ATSC Corp, reportedly for RM2.2 billion — thus expanding its serviceability for another 15 years. And it is now even looking at offering the RMAF the fourth-generation Su-35 or even its latest Su-57E (the equivalent of the United States’ F-22) if it wants to upgrade. 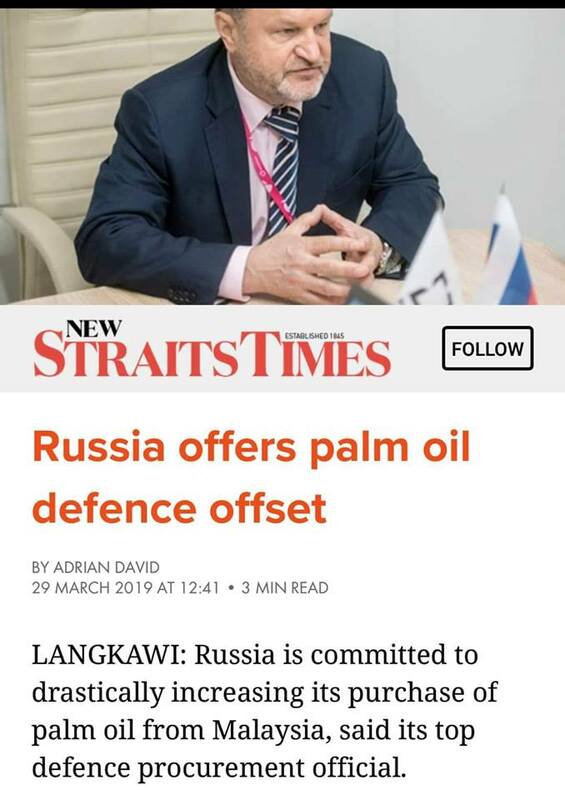 Rostec State Corp international cooperation and regional policy director Viktor Kladov told the New Straits Times Russia was willing to buy Malaysian palm oil in substantial amounts to improve the bilateral trade balance, with the possibility of trade-offs for arms and defence procurement and transfer of technology and job spin-offs. “We are aware of the palm oil ban for biofuels in Europe and Russia is ever-ready to help Malaysia by buying more palm oil. At present, 90 per cent of Russia’s palm oil is imported from Indonesia and we intend to change that (in Malaysia’s favour). “I have personally spoken with Prime Minister Tun Dr Mahathir Mohamad on this matter at a private meeting with him yesterday, and applauded him for his great vision. This can lead to improved defence offset packages that can greatly benefit Malaysia,” he said in a special interview at the Langkawi International Maritime and Aerospace exhibition (Lima) 2019 at the Mahsuri International Exhibition Centre in Padang Matsirat. Europe is the largest buyer of Malaysian palm oil after India and now even China has reduced imports of the commodity. Kladov was a prime mover in enhancing Russia-Malaysia defence relations during Dr Mahathir’s first 22-year tenure as prime minister. It culminated with a several hundred million dollar offset deal, involving palm oil, with Malaysia initially procuring 18 MiG-29N Fulcrum air superiority fighters in 1995. The MiG-29N — two of which crashed in 1998 and 2005, respectively — was decommissioned in 2017 owing to high maintenance costs of RM262 million a year. Several countries, including Bangladesh and India, are keen to buy the MiG-29N. Subsequently, in 2003, Malaysia purchased 18 Flankers from Russia’s Irkut Corp for US$900 million (RM3.67 billion), also involving palm oil purchase. The offset deal led to the country’s first space programme with Malaysia’s first astronaut to the International Space Station in 2007. Owing to budgetary constraints, the RMAF has deferred its multi-role combat aircraft (MRCA) programme to 2025. Instead, it is looking at improving on its lead-in fighter jet fleet, which is made up of the Italian Aermacchi MB339. “In fact, Russia’s Yak 130 is similarly designed after the Aermacchi and we are prepared to trade in RMAF’s ageing fleet,” said Kladov. He added that he also had a discussion with RMAF chief General Tan Sri Affendi Buang who was keen on strengthening and improving the serviceability of its fighter jets. “He is all for Russia to give strong technical and maintenance support for its existing Sukhoi fleet. Affendi is not in favour of procuring too many fighter jets as Malaysia is a small maritime nation,” said Kladov. On another matter, Kladov said the Fire and Rescue Department and the Malaysian Maritime Enforcement Agency were interested in procuring up to eight units of Ansat, Mil Mi-8/17 and Kamov Ka-32A11DC from Russian Helicopters, a division of Rostec State Corp.